Distributions - operating systems and development environments for the Raspberry Pi. Kernel Compilation - advice on compiling a kernel. Performance - measures of the Raspberry Pi's performance. Programming - programming languages that might be used on the Raspberry Pi. 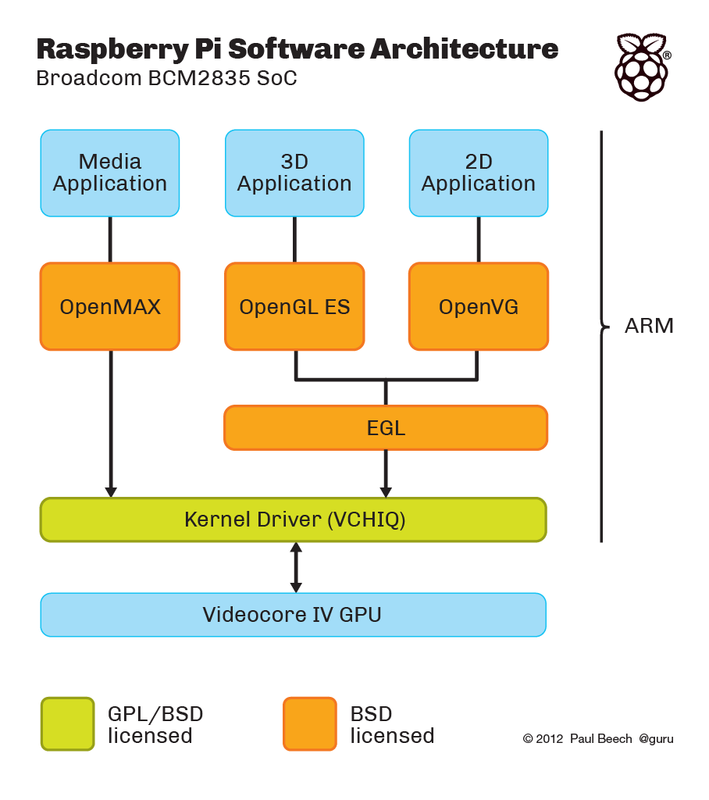 The Raspberry Pi contains a Broadcom VideoCore IV GPU providing OpenGL ES 1.1, OpenGL ES 2.0, hardware-accelerated OpenVG 1.1, Open EGL, OpenMAX and 1080p30 H.264 high-profile decode. There are 24 GFLOPS of general purpose compute and a bunch of texture filtering and DMA infrastructure. Eben worked on the architecture team for this and the Raspberry Pi team are looking at how they can make some of the proprietary features available to application programmers. Currently C header files and libraries for many of the Broadcom APIs are located in /opt/vc/include and /opt/vc/lib respectively, or available from GitHub within the same directory structure. Some documentation is contained within comments in the header files, as well as documentation for the OpenMAX IL components in the documentation directory on GitHub, however it is severely lacking and difficult to understand in a general sense for people wanting to experiment with the device due to it being proprietary. As such, we encourage you to edit this page to help us build much better open documentation. The Raspberry Pi requires that the bcm_host_init() function is called first before any GPU calls can be made. Before calling any of the vc_* functions, you need to initialise vcos and vchi, and make a vchi connection, before then calling the corresponding vc_*_init function for the part of the library you want to use: vc_vchi_dispmanx_init, vc_vchi_tv_init, vc_vchi_cec_init or vc_vchi_gencmd_init. Linking against the EGL library (-lEGL) also requires you to link against the GLESv2 library (-lGLESv2). graphics_get_display_size() is a Broadcom-specific function. The Raspberry Pi comes with seven sample programs and two helper libraries in the /opt/vc/src/hello_pi directory showing some of the system's capabilities and sample code. This sample is a GPU-assisted H.264 encoder using the OpenMAX APIs, and currently works with raw frames. It outputs a raw H.264 file. This sample plays a sine wave for ten seconds using the OpenMAX APIs. This sample shows how to get a OpenGL ES context on the Raspberry Pi. This library is described as: This API defines helper functions for writing IL clients. * events can be checked or waited for. bcm_host is the Broadcom hardware interface library. These APIs allow controlling the HDMI and SDTV video outputs of the Raspberry Pi, as well as allowing the user to query the supported HDMI resolutions and audio formats and turn on/off copy protection. The Raspberry Pi can only have one output active at a time - turning on the HDMI automatically turns off the SDTV and vice-versa. However either can be turned off using the vc_tv_power_off() function. rpi-output-swapper Uses tvservice apis to power on HDMI or SDTV display in specific or preferred mode. The vc_cec APIs allow programs to interface with the Consumer Electronics Control (CEC) host middleware on the system to send CEC packets, set strings for the middleware to auto-respond to certain requests or override the middleware handling by adding custom callbacks. Therefore, to create a EGL surface you must also use the Dispmanx library to get a dispmanx element handle. The hello_triangle source code provides example code to do this. See Getting Started with EGL post by Jon Macey. Extended documentation available in the EGL Version 1.4 Specification and Simple Reference available in the EGL 1.4 API Quick Reference Card. This function allows you to get the size of the display, and is often used in creating an EGL Surface. width and height are pointers that you pass in to where you want the response values to be written to, display number 0 is usually used for the Raspberry Pi. return value of >= 0 indicates success, <0 indicates failure. This function is implemented in libbcm_host, and the implementation has been made public showing that it internally calls the vc_dispmanx_display_get_info function to get the width and height of the current mode. Bugs present in early versions of the firmware caused this function to always return 1920x1080, however this can easily be fixed by updating the firmware with Hexxeh's rpi-update (see the Updating firmware page for help). The Raspberry Pi supports OpenVG 1.1 for hardware-accelerated two-dimensional vector and raster graphics. See the full specification here or the API quick reference card. See /documentation/ilcomponents on GitHub firmware repository for official documentation. TODO: Sample of how to use OpenMAX to decode audio/video/images, etc. JogAmp JOGL - JogAmp JOGL Java bindings for EGL and OpenGL ES for Raspberry Pi implemented using Gluegen. XBMC - a media center, omxplayer's "big brother"